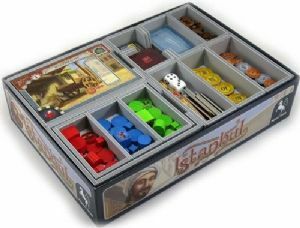 This insert is designed to be compatible with Istanbul, and includes space for the Mocha & Baksheesh, and Letters & Seals expansions. The design provides both efficient storage and improved game play. Many of the trays can be utilised during the game, and they greatly aid set-up and clear-away times. The rules act as a lid on top of the trays. 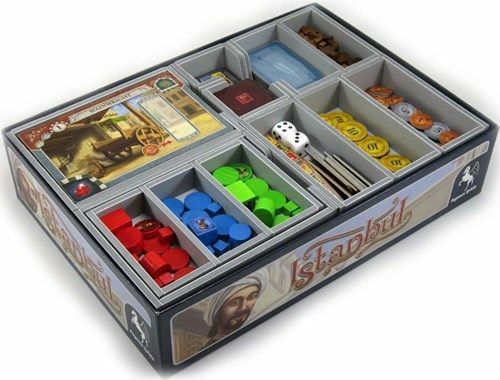 The two large trays for place and barrow tiles are meant to remain in the game box and not be removed for game play. The one containing the barrows has space of the two player piece trays to be stored on top of the barrows.